Dada during a family planning outreach at the Dandora informal settlements. Although motivation has always been viewed as monetary, Tupange, the Kenyan urban health initiative funded by the Bill & Melinda Gates Foundation, has found that community health workers (CHWs) can be motivated to provide quality services to their community in sustainable and cost-effective ways that do not involve financial rewards. Nairobi, Kenya—Deep in the heart of the Dandora informal settlements, Dada, a CHW with Tupange, arrives at an overcrowded high-rise building where she will be meeting and speaking to a group of young mothers. Armed with pills, condoms and literature on family planning (FP), she announces her arrival from the staircase, and, within a matter of minutes, she has an audience of 12. During today’s meeting, she will speak to the mothers about the benefits of child spacing and demonstrate how different FP methods work. For those who want to have long-term FP options, she will refer them to a health center. You can tell from Dada’s interaction with these mothers that she loves her work. Dada, which means sister in Swahili, has been working as a CHW for eight years. During her initial training with Tupange, she was taught the basics on FP; she learned how to educate families on the various options available to them and how to distribute commodities to her clients. She was also introduced as a health promoter, a link to the health facility where she refers all her clients. Despite not being paid for the services she provides, Dada wakes up each day eager to go to work. 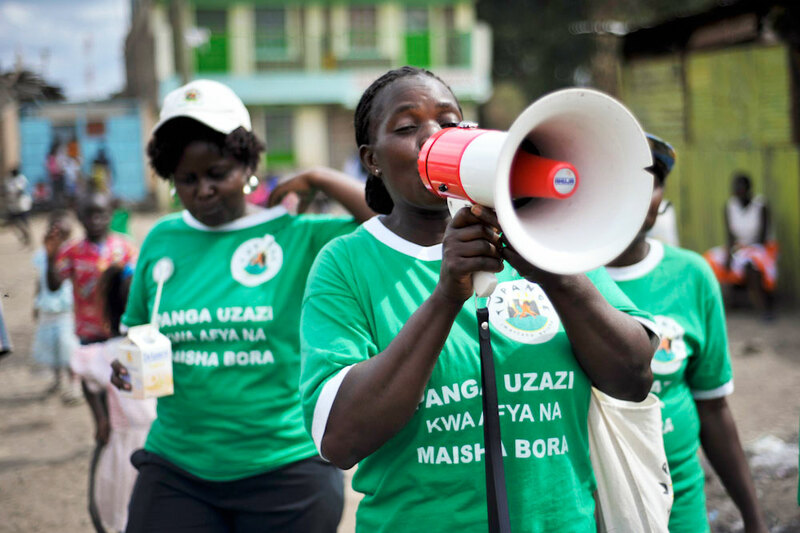 In her branded T-shirt and nametag, she stands out as she walks on the streets, “I do this because I want to help the people in my community have healthy families,” Dada says. CHWs have proven to be a critical gateway for ensuring that underserved communities have access to basic health care—from rural communities living far from health facilities to urban centers where proximity does not necessarily translate to access. The Ministry of Health has come up with a Community Health Strategy in which CHWs are given basic training that enables them to offer basic health services at the community level. Tupange has been able to incentivize CHWs through training, providing them with formal uniforms [branded T-shirts and nametags], linking them with health facilities for referral cases, and ensuring they have access to FP commodities. Dada values immensely the training she received. “It has made me credible, and people look up to me for information,” she says. “Before the training, I had no voice at all.” Today, elders looking for advice and information, especially ahead of national health campaigns, seek Dada out. She even educates the community during the chiefs’ meeting and on community dialogue days. In Kenya, Tupange has trained 950 CHWs on promoting health through FP, recordkeeping for tracking their work, counseling, and distributing pills and condoms. During the last three years, CHWs have made 69,616 referrals to heath facilities and distributed 80,383 pills to community members. These CHWs, who are well-respected and trusted in the community, go door to door educating the people on the benefits of FP for the health of the mother and child. To keep their knowledge updated, the CHWs have regular monthly meetings during which they share their challenges and exchange knowledge. “Without CHWs, many people would die, and even fewer people would be using FP,” Dada says.